APPEARANCE: Dark ruby red with clarity, cool pink/lavender edges. NOSE: A light layer of red fruits: strawberry, raspberry. Opened to aromas of soft flowers, a kiss of oak, and molasses. TASTE: Chewy, round, mouth-filling, balanced, smooth, and mellow. I couldn’t find any technical data on the type/age/time in the oak, but it sure tasted like French oak to me. Became more delicious as it opened up, remaining smooth and medium-bodied. Almost a seductive quality to it. FINISH: A bit of Syrah-ish spice on the moderately long finish. CONCLUSION: Tasty and surprisingly dry (yet not excessive mouth-puckering tannins) despite the rich aromas, flavors, and mouth-filling quality. FRONT LABEL: From the porch of our home on the second story of the Leese-Fitch Adobe, we look across towards Sonoma’s City Hall. Dedicated in 1908, this historical landmark in the Sonoma Plaza still stands as the centerpiece of our town. 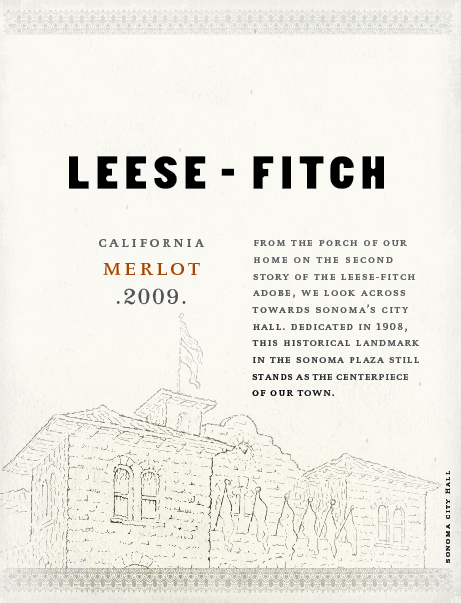 BACK LABEL: This wine celebrates our home, the Leese-Fitch Adobe. Built in 1836, this historical landmark in the Sonoma Plaza was named after Jacob Leese and Henry Fitch, brothers-in-law to General Mariano Vallejo, the founder of the town of Sonoma. WINERY NOTES: With rich garnet color, this blend has aromas of caramelized apple, fresh boysenberry syrup, sage, and light clove. In the mouth, there are flavors of red raspberry, cedar, dark plum, light cocoa, and pomegranate. The finish shows lingering tart cherry, cardamom spice, and mocha. This vintage was built around a lot of 2009 Monterey Merlot. This block of Merlot provides jammy fruit with subtle spice and rich mouthfeel. The appellation of Clarksburg brings a dab of Syrah and Merlot to the blend that add additional power in tannin as well as nice herbaceous notes that add complexity. There is a leg of Lodi Merlot which contributes rich fruit and brambly earth notes. Last but definitely not least, we added Napa Merlot that has been on oak for a few years. It was dark and sappy with great cedary integrated oak and spice. This leg added complexity to the blend and gave the blend a nice backbone. Pairings: This is a great glass of Merlot to have with … pork stir fry with a plum sauce over brown rice, grilled gulf shrimp over dirty rice and steamed snap peas, or BBQ chicken pizza with gruyere cheese and caramelized onions. Leese-Fitch is a division of The Other Guys, a progressive and innovative company owned by the Sebastiani family. This wine is from the Other Guys portfolio of Don Sebastiani and Sons which in 2005 was named American Winery of the Year by Wine Enthusiast Magazine. This entry was posted in California, Merlot, Syrah/Shiraz. Bookmark the permalink.